Mangaluru, June 15, 2015: Two engines and an unreserved coach of Train No.16518 / 16524, Kannur / Karwar – Bengaluru Express has derailed between Shirivagilu and Yadakumari stations of Mangaluru – Hassan section in Mysore Division, Soutt Western Railway at 2.10 am on June 15. No casualties or injuries have been reported. Consequent upon this, the train traffic in this section has been temporarily disrupted. Accordingly, train services have been regulated as under, says a press communique from Southern Railway. 1. Train No.16518 Kannur / Karwar – Bengaluru Express(Derailed train) which left Mangaluru Central on June 14, has travelled back to Subrahmanya Road and is being diverted via Mangaluru Central, Kannur, Shoranur, Palakkad, Erode and Salem. This train has left Mangaluru Junction at 09.30 hours. 2. Train No.16515 Yeswantpur – Karwar Express scheduled to leave Yeswantpur on June 15, stands cancelled. 3. Train No.16517 / 16523 Bengaluru – Kannur / Karwar Express, which left Bengaluru on June 14 has been partially cancelled between Sakleshpur and Kannur / Karwar on June 15. 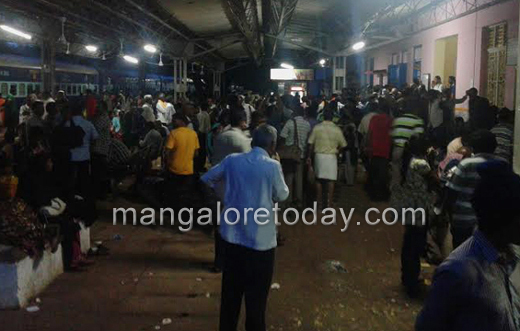 Buses have been arranged by South Western Railway, Hubballi for moving passengers by road to Mangaluru / Karwar.